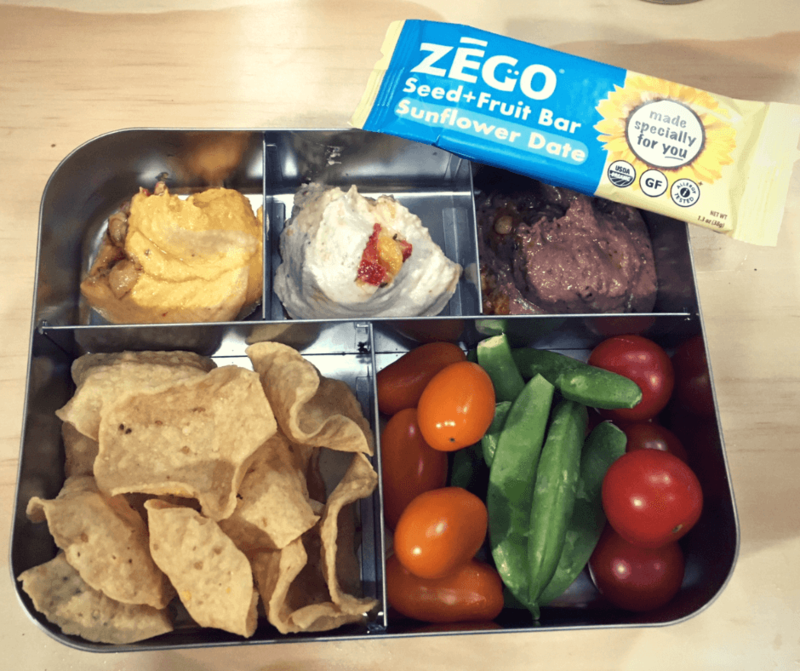 Allergy friendly lunches can be a challenge sometimes. 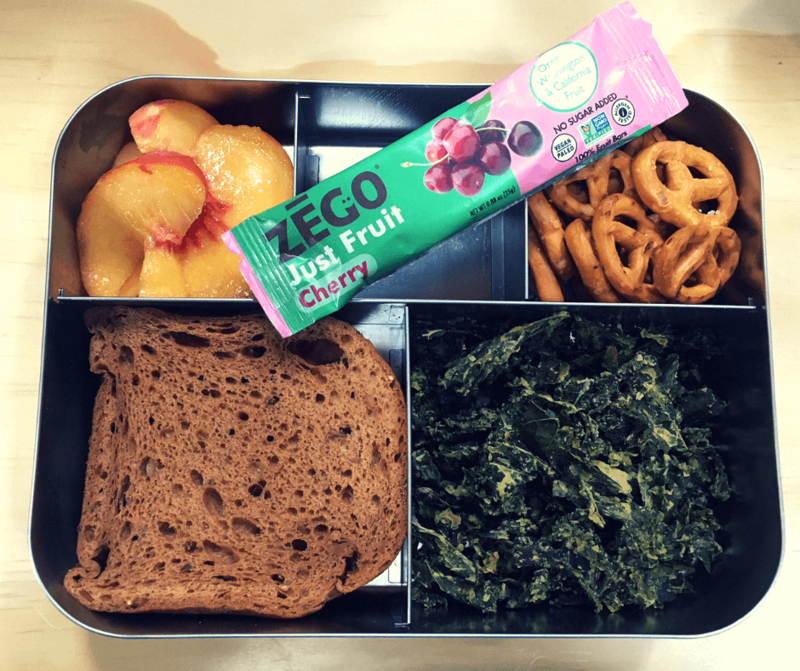 And when it comes to school lunches, sometimes you have to think about allergies that affect the whole school, such as if your child goes to a peanut free school (even if they themselves don’t have nut allergies). Here we are to the rescue with some fresh ideas for you! 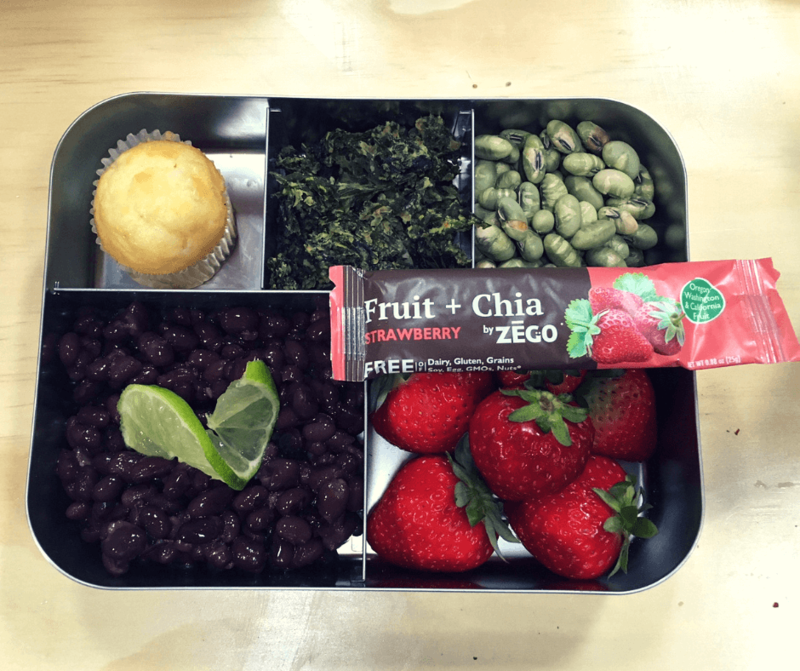 This is a fun box with some different items that you might not think of to put in a lunch every day. The nice thing is you can pack one for your child and one for you too! The spicy sweet of the Lemon Ginger bar is the perfect addition to all these flavors. It is naturally vegan, nut free, and wheat free. You can easily make it soy free by substituting tamari with another sauce that you love. Sushi can be a fun activity to make together as a family the night before, and can be made with many different types of ingredients. An important thing to double check with these foods is for fish and shellfish. Sometimes those ingredients can show up in something like kimchi, so check that it is a recipe that works for your dietary needs. The other good news is that this box is stocked full of probiotics and antioxidants! 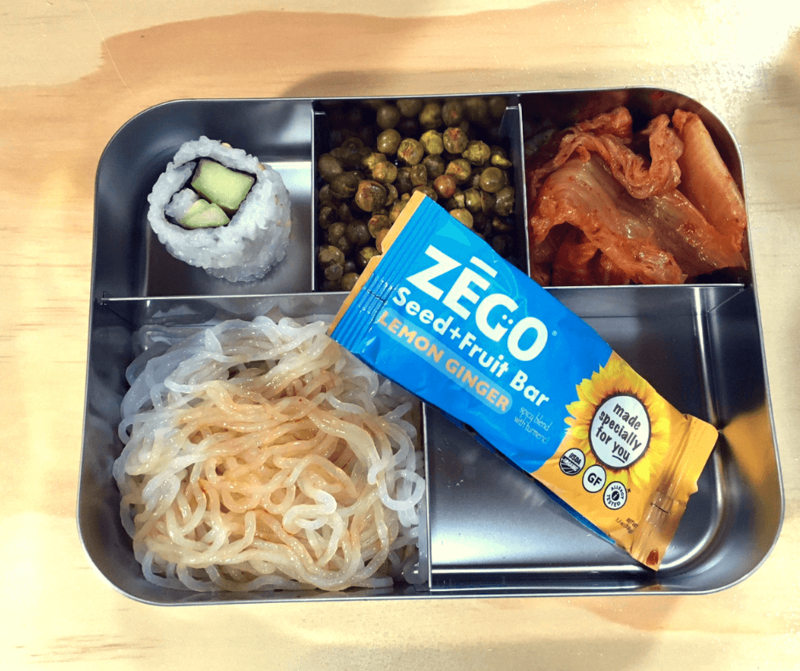 If your child is not a fan of traditional sushi, then you can make “fruit sushi” by rolling out a ZEGO fruit bar for the seaweed, adding sweet sticky rice, and pieces of your favorite fresh fruit. Mango or something tropical would be especially good. This is not only nut-free, but also gluten-free and vegan. If you don’t need to be gluten-free, you could easily swap out your favorite pretzels and bread for the gluten-free versions. Peaches and cherry are flavors that go together well, and the kale chips add some nice crunch and veggies. You can make the kale chips yourself, or buy your favorite allergy-friendly brand. What is also nice about this combination is several protein sources without meat, dairy, or eggs. While sandwiches are a staple in many lunches, you can also twist it up for some variety. 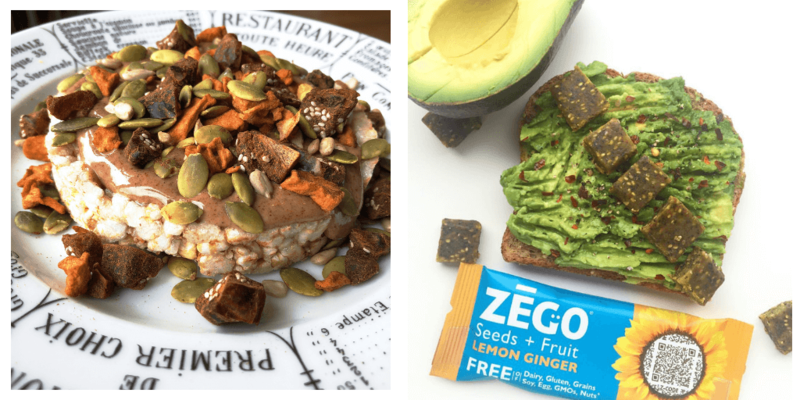 Consider putting Sunbutter and Mix-Ins on a rice cake, or cutting up your favorite ZEGO flavor with toast and any other spread – like this delicious avocado toast! Most of the boxes in this list are dairy free, but this is proof that there are lots of ways to get protein without dairy! The mini-muffin can be gluten-free if you want. And if you can’t have soy, you can swap out the roasted edamame for a handful of Mix-ins, or dried peas or lentils. Lime and sea salt make the beans a little more interesting. You could also add salsa to the beans if you want a bit more spice. 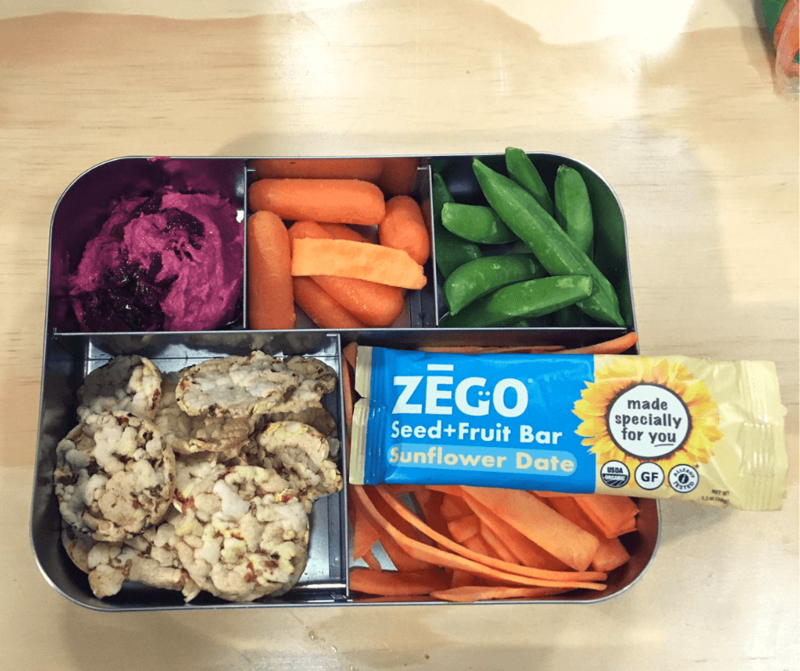 One of the great things about ZEGO bars is that they can be slipped in a lunch box in addition to a full bento box in order to get in a little more nutrition in an easy grab package. 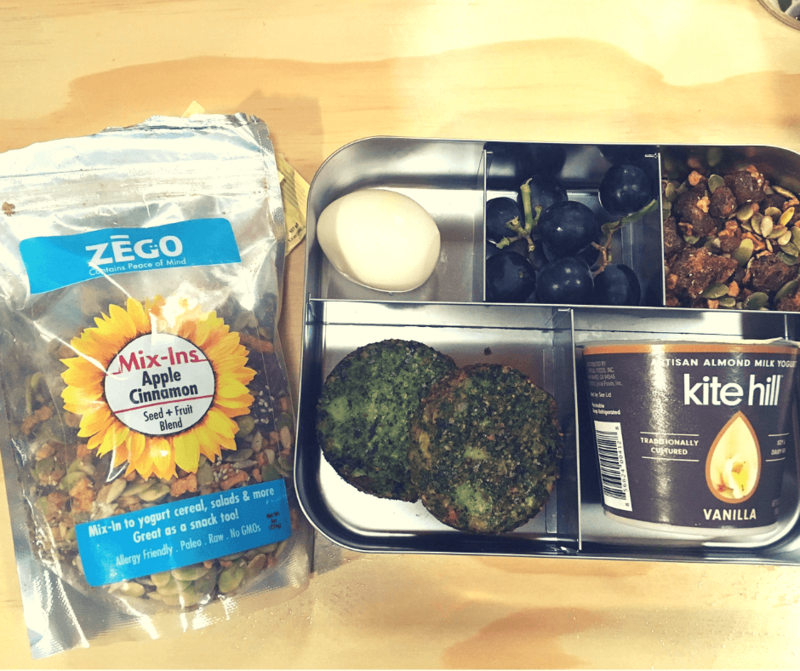 There are a LOT of flavors going on in this box, which is why a Sunflower Date bar seemed like a good fit. It adds more protein with a nice smooth taste, that goes well with the beet hummus and crunchy veggies. If you haven’t started experimenting with your hummus choices, you should give it a try! There are a lot of different flavor options. And the crunchy sweet of the raw sweet pototo slices is a good way to add variety to the normal dipping vegetables that you might think of. If you hae corn allergies, you can always swap out the corn chips for rice cakes, pretzels, or whatever other crunch dipper you like. Here is another twist on hummus and chips. This one includes multi-grain chips, a couple different veggies, and siracha carrot, white bean, and black bean hummus. The Sunflower Date bar adds some subtle sweet to the box. Again, there are always other chip choices to suit your needs, and get creative with trying different types of veggies as a dipper! This box is almost like a brunch box! The spinach patties are almost like hash browns, and the yogurt is ready for the Mix-ins to be added for an instant parfait. It has a lot of variety in nutrients and a high protein content. If you need to skip the eggs, the Mix-ins still provide a high-protein alternative. Maybe include both flavors if you want to make it egg free! Pick whatever type of yogurt meets your dietary needs, and add some probiotics to your meal in the process. Sometimes all it takes to liven up a lunch or snack is to present it in a different way! 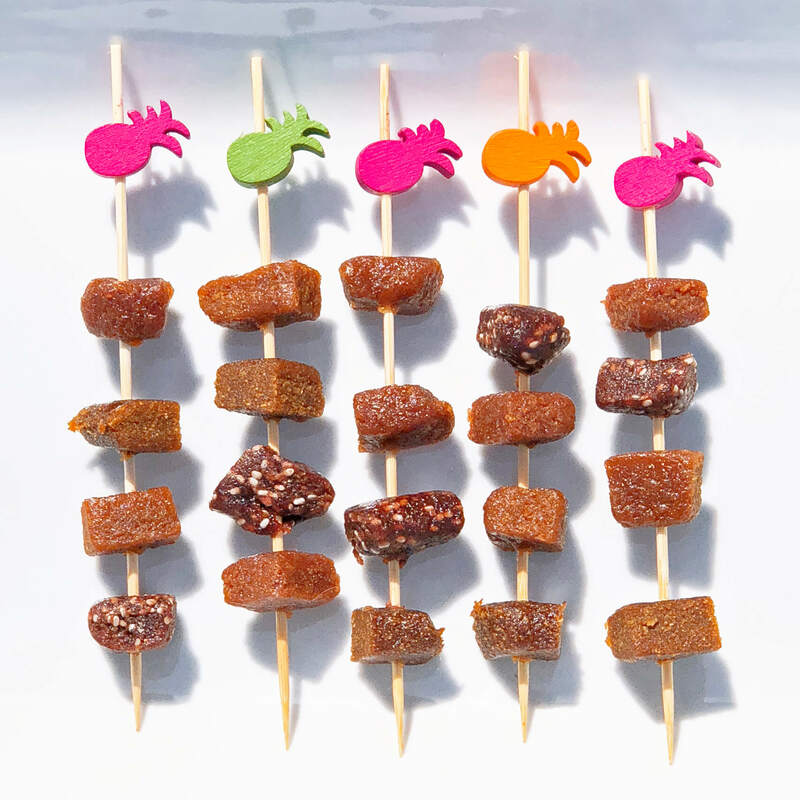 For example, make fruit kebobs with ZEGO bars, or intermingle the bars with fresh fruit on the kebob. You can also use small cookie cutters to cut out shapes from your bars to give your kids a fun treat to look forward to. Which of these ideas are you going to try?